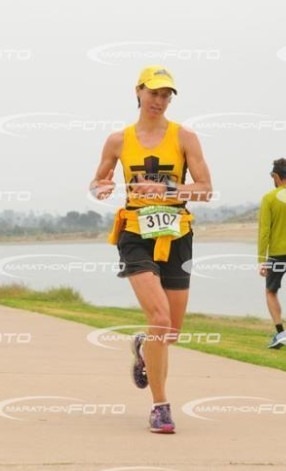 Doing the SD Rock n' Roll Marathon for the second time. My very 1st marathon was this one in 2002...just before Troy and I got married. I'm here on my own this time. My parents live in SD so they are my support crew. My mom drops me off early at a strategic spot...near a secret set of porta potties. The secret to every great race is finding a secret pit stop. I call Troy and the girls and pray with them. Troy is racing the USA Production tri in Folsom and the girls are volunteering. I meet up with FCA teammate, Sierra Snyder, at the start for prayer. So awesome to find a familiar face and sister in Christ. My goal today is to run 3:30. That time in the past had been doable but not sure if I'm quite trained up for that. Gonna try. My hamstrings were cramping on my last long run so not sure how they will do. My Garmin tends to register the miles earlier than the actual mile markers so I'm adjusting the pace accordingly. Instead of putting the virtual runner pace at 8:00 (3:30 marathon pace), I set it for 7:56. I get into my corral, #3. I see the 3:30 marathon pacer in Corral #1 and the 1:45 pacer for the half marathon in Corral #3. Well, that is a dilemma. I decide to go onto Corral #2 as a compromise. Corral #1 starts and they hold #2 for 30 sec. Okay, here we go! I feel great as usual starting out and make myself slow down. Mile 1 is 7:49. Slow down! The great Olympian Meb goes by with a "Meb" pace stick in hand. Huh? He's pacing a group? Wow, that's nice of him to pace folks! And he has the Olympics coming up soon. He flies by looking like he's jogging. Mile 2 is 7:56. Perfect! Mile 3 is 8:01. There is a bit if a hill here. On pace. Mile 4 is 7:54. Feeling strong! A long way to go yet! There is an "Elvis" running just behind me. It's cool because of all the constant cheers for him and because he responds with a "thank you baby" or "thank you man" in the voice. Mile 5 is 7:53. Up ahead I see small a-frames of pictures lining the street. As I get closer, I can see that they are pictures of military men and women killed in the line of duty. It lists their name and age they passed. It's so overwhelming that I start to cry. A little further down the street are people holding large American flags. I am sad, appreciative of the sacrifice and inspired to keep pressing on. A few guys go by with a M70 Champs bib on their backs. Whoa! These guys are in their 70s and running past me like I'm standing still. This must be a half marathon champs race versus my full Marathon...yet, still extremely impressive no matter their distance. I hope my racing career continues for that age! Mile 6 is 7:47. The 1:45 half marathon group catches up to me. Hum, I think I'm still on pace but better stick with them now. Mile 7 is 7:49. Great to have this pace group! Thanks God! Keeps me focused. I see a sign that says "If Trump Cam Run, So Can You". Ha, good one! Mile 8 is 7:32. Downhill...weee! The pace group pulls off and I'm alone again. I still have Elvis! There are runners going all directions now. I see half and full marathoners coming the opposite direction and am confused. I just separated from the half folks. I figure out that I'm running back the way I came and these folks are heading out to where I came from. Mile 9 is 7:56. Here comes a hill! Mile 10 is 8:09. Still feeling alright. Mile 11 is 7:54. I'm feeling strong and hoping that I'll actually be a bit a ahead of pace at the half marathon point. Mile 12 is 7:58. So far I've finished a pack of Clif Bloks and a gel. I have 3 more gels to go. Mile 13 is 7:53. 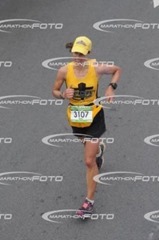 I cross the half marathon point at 1:45. My average pace appears to be 7:53 so I set my virtual partner to that pace and hope I can hold on! Mile 14 is 7:43. Elvis passes me and I try to stay near. I can already see the top guys heading back. Wow! Mile 15 is 7:56. Approaching Sea World. Still feeling like I can hold the pace but I'm definitely feeling more fatigued. Mile 16 is 8:01. Getting harder. We run through a row of screaming cheerleaders. They are handing out leis and I think of grabbing one for the girls but I'm not willing to carry it. A gal runs by in a wonder woman dress and tells me she likes my jersey. Mile 17 is 7:55. I see Sierras' hubby, John, and their kiddos cheering. So great to finally see a familiar face!! I see them a second time as we loop back. So helpful! Thanks God!! Mile 18 is 8:04. It's really getting tough now. I take my 3rd gel. I'm surprised I've eaten so much...already more than I ever have in a straight marathon! 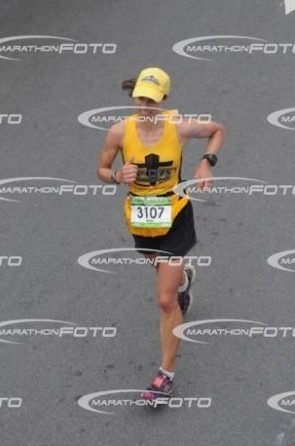 Mile 19 is 8:08. Oh boy! Want to be done! Slowly starting to fall off pace. Mile 20 is 8:20. Just trying to minimize the damage. My heart rate is now hovering around 170. I know from many past races that that's the danger zone for bonking. I'm fueling well this time so that hopefully won't happen. Mile 21 is 8:23. Okay, I’m still loosing ground. Still hoping to finish close. Pretty soon I’m heading onto Hwy 163. I hear there is a hill around here. Oh my! That is a steep hill up ahead! A much older gal passes me and I try to stay with her but she surges. I pass a bus that is for athletes to take a break if they overheat. Sounds nice but I want to get this over with! I hit the hill. Oh boy, I’m hurting! I don’t know how long this is.. I cannot see the end! I look at my watch. 3:30 is clearly out but maybe I can do under 3:35? Mile 22 is 8:58. Almost to the top I can see now. I really dislike this freeway! It was kind of cool at first but now I just want to see real streets again! Yeah, the hill is over but the damage is done. I’m just trying to survive. I am now realistically looking at 3:38 to 3:40 now. My heartrate is above 170 and I know and feel that I’m giving a good effort. Mile 23 is 9:06. 3 more miles, 3 more miles! 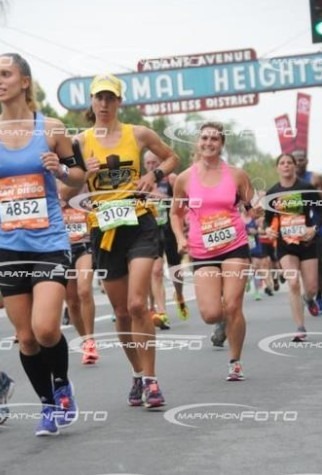 Mile 24 is 10:21…and this is with a downhill. Lord, help my attitude! Help me not be so frustrated. Mile 25 is 9:19. One more mile! I can do this! Finally we take an offramp! I’m headed straight down to the water and downtown. Yes! I will finish, I will get that jacket…all because you are sustaining me Jesus! Mile 26 is 9:07. 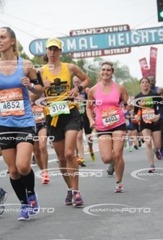 I see my Mom and Dad as I come towards the finish. I cross the line with such relief and in such pain. Thank you Lord for helping me get it done!